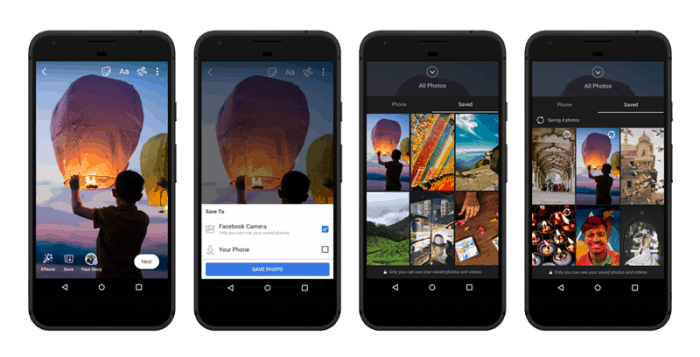 Facebook rolls out three new stories features that are, ‘save photos and videos to the Facebook cloud’, ‘archive Facebook Stories‘ and ‘share voice messages with friends’. For now, the updates are only introduced to users in India, but Facebook says they will soon arrive worldwide. When using the Facebook’s in-app camera to click photos or video, users will have the option to save them in their Facebook account in the cloud rather than on their device’s storage. Users can also just click a photo through the in-app camera, save it, and post at a time of their suitability. Similar to Instagram’s archive, Facebook Stories Archive lets users keep an archive to favorite Stories to a separate section before they start disappearing after 24 hours. Stories that you have archived are visible only to you. Facebook’s new voice posts will allow users to create audio-only stories. This option will be available while using the Facebook’s in-app camera. The feature is currently available for Facebook Lite users while Android users will see the feature in coming weeks. “Users can post voice posts on Stories of up to 20 seconds. Voice posts can be shared in the same way that Stories and News Feed posts are shared”, -Facebook said.